Journeyman rock singer whose good fortune was to be paired with Roy Brown in an act at a New Orleans club in the weeks leading up to the release of Brown’s breakthrough record “Good Rocking Tonight”. When the song hit and Aristocrat Records came to town looking to somehow capitalize on Brown’s newfound success they ended up signing Samuels as the next best thing. Despite the charade almost getting him killed, it did launch a lengthy career for the singer. 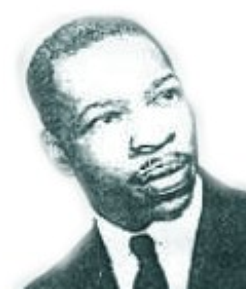 Born in Baton Rouge, Louisiana in 1923, Samuels, who’d moved to New Orleans at twenty years old in 1943, possessed a strident baritone and little in the way of versatility, yet was a reasonably effective vocalist who offered little variety but delivered each song with determined enthusiasm. Not quite 24 years old he secured a job as manager/performer at the Down Beat Club which would soon employ Roy Brown and the two performed together nightly as The Blues Twins, though no mention is made of how their act was constructed, whether they each did a separate set or if they shared the stage, and thus presumably shared Brown’s material as well. When Roy was lured away to another club soon after his record broke Samuels remained until fate came knocking. After his Aristocrat tenure which offered him perhaps his best chance at stardom, since he was merely singing all of Roy Brown’s songs and passing them off as his own (even getting writing credit on them), he bounced from one record label to another over the next decade and a half, never earning a hit but carving out a decent career with some solid efforts before fading into obscurity, a mere footnote in the career of a legend.